This Award of Merit is issued to The Renowned Spiritual leader Supreme Master Ching Hai. Two thousand disciples from all corners of the world responded to the invitation and then attended this great dinner party.The Supreme Master Ching Hai was presented the awards by high officials from all six states on behalf of their Governors. More than two hundred of the guests invited were prominent government officials, celebrities from society as well as journalists. 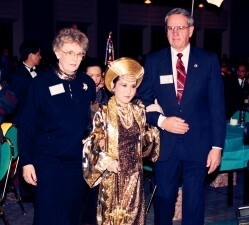 During the ceremony, each state presented the Supreme Master Ching Hai with a specially made bronze bust of Herself. There are now five busts which will be placed in public parks or public places to be revered by the people of the states. Ms. Barbaba J. Finch, the representative for the Governor of the state of Iowa, and Mr. Paul D. Schleer, the representative for the Governor of the state of Missouri and the master of ceremonies of the evening, join to welcome the Supreme master Ching Hai to the stage to receive the awards. Mr. Paul D. Schleer, the representative for the Governor of Missouri state, was the master of ceremonies for the evening. He said that to represent the governor in presenting the award to the Supreme Master and also be the master of ceremonies of such an important event made this the most memorable evening of his life. He then read out the congratulatory messages from President Clinton and former Presidents Bush and Reagan and first lady. 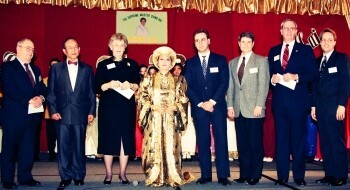 In his message, President Clinton said, "Supreme Master Ching Hai is a living example of world peace and love for all, especially Her help for the refugees and the many suffering people in the U.S.A."
Mr. Hung Kwang Chen, Chief Secretary of the World Cultural Communication Association, made a speech in the ceremony. He introduced the Supreme Master Ching Hai, who comes from Au Lac, and said how She spent a number of years, after having finished Her studies in England, searching for the Truth, and eventually attained perfect enlightenment by practicing the Quan Yin method. Her extensive knowledge and transcending power in spirituality more than qualify Her as a spiritual Master for the people of the world. Her charitable deeds are done purely out of compassion. Her willingness to accept these awards is only for taking the opportunity to spread the Quan Yin Method, so that even more people can be enlightened, and the world be more benefited. Mr. Chen emphasized that it was the only first time in a decade that the "World Spiritual Leadership Award" had been presented, and that only a person who had made great contributions to the world such as the Supreme Master Ching Hai was qualified to receive it. Master and the representatives of the governors of the six states. The representatives of the Governors of the six states each gave a speech, extending their gratitude and the highest respect to the Supreme Master Ching Hai. They also read a proclamation that designated the 22nd of February as "The Supreme Master Ching Hai Day". Then, together with Mr. Chen, they presented the Supreme Master Ching Hai with the "World Spiritual Leadership Award" cup, and 5 bronze busts of Herself, to receive Her blessing. Lastly, on behalf of the Republican party of the U.S.A., Mr. Hung Kwang Chen presented 2 medals to the Supreme Master Ching Hai, one for Her relief efforts in the flood disaster of the Midwest, U.S.A., and another for aid in the Mount Pinatubo volcanic eruption disaster in the Philippines. Afterwards, the Supreme Master Ching Hai gave an acceptance speech. She said that Her followers and Herself never expected any recognition or rewards for anything that they do for the people of various nations around the world. She felt that such warm-heartedness and courtesy that She was given for Her efforts in the relief of the flood victims was hard to refuse. The wonderful performance that brings laughter throughout the hall. 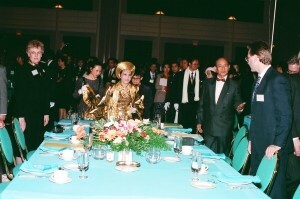 Sitting with the representatives of the states, Master enjoys beautiful evening with them. After the award ceremony had concluded, the celebration began. There was an abundance of entertainment for the evening. Disciples from different parts of the world presented dances, songs, dramas and music symbolic of their various traditions. Responding to the warm request of the audience, Master goes on to the stage to sing spiritual songs which She has composed. After the performances by the disciples, the Supreme Master Ching Hai could not refuse the warm and earnest request of the applause of all the guests, and She went on the stage to sing one of Her own compositions, "The Ocean of Love". 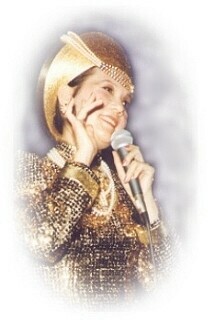 This extraordinary spiritual leader displayed Her multi-faceted talents. Her songs are not only beautiful, but also profound in their meanings, and touch people's very souls. Her voice is so clear and perfect that it has the quality of a professional singer. Lovingly encouraged by the guests, the Supreme Master Ching Hai continued to sing several of Her compositions, which were rich in spiritual taste, and in rock and roll rhythm. Then, Her followers crowded around and even on the stage. Everybody clapping their hands and singing in chorus with Master. The scene was warm and merry. The party did not end until after one o'clock in the morning. It was a thrilling event which combined spirituality and concern for the society, and provided a significant purifying effect to a world which is more and more inclined towards materialism.